In the 1985 film Rocky IV, Sylvester Stallone's titular character faces the challenge of fighting Russian champion Ivan Drago in Moscow during the height of the Cold War. In cricket at the time, West Indies were Drago, a seemingly insurmountable challenge to every other team in the world. But Pakistan were one team that consistently challenged their supremacy a la Rocky Balboa. 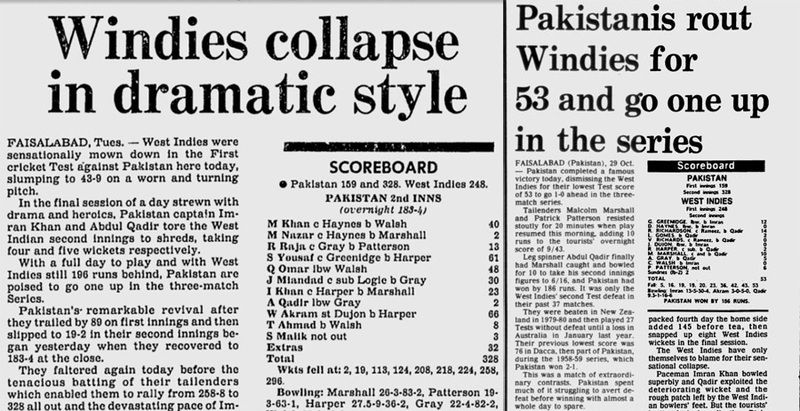 From June 1, 1976 to March 30, 1995, West Indies played 142 Tests and lost only 19, four of these to Pakistan. Each defeat came when the series was still alive - Port-of-Spain in 1976-77, Faisalabad in 1986-87, Georgetown in 1987-88, and Karachi in 1990-91. The Faisalabad Test, where Pakistan shockingly routed West Indies for 53 - their lowest Test score at the time - wasn't far from being a Hollywood drama itself. "Every time we played West Indies during their invincible period, we looked at it as an opportunity to beat the best side in the world rather than sit back and be prepared for a loss and devastation," says former Pakistan batsman Rameez Raja. "We strongly felt that a win would help to raise the status of our team and players. We backed ourselves because of the talent that we had. West Indies also respected us for what we brought to the table against them - aggression." Offspinner Tauseef Ahmed says it was the quality of Pakistan's spin bowling that often troubled West Indies. "We talk about power-hitting as a part of modern cricket these days, but West Indies had been playing that brand of cricket in the '80s, so beating them was always great. They struggled against spinners, especially legspinners, and we had the finest spin attack at that time." Pakistan under Imran Khan were conscious of avoiding being whitewashed by West Indies. "Imran Khan's leadership and encouragement lead us to believe that we could challenge West Indies," says opener Mudassar Nazar, who played two Tests of that 1986-87 series. "While I won't say it was the greatest Test match we played in, it was one of the better ones - to overcome a great West Indies team. In a lot of ways the game was fairly even until their fourth-innings collapse." West Indies players from the match also acknowledge Imran's role in the win. "That was the nature of Pakistan under Imran Khan's leadership, which pretty much was an extension of his personality," says Richie Richardson, who top-scored in both innings for West Indies. "Plus with tough competitors like Javed Miandad, Abdul Qadir, Wasim Akram on the rise, they proved a tough but great refreshing competition for us." Michael Holding and Joel Garner missed the series, which gave 23-year-old fast bowler Tony Gray a chance to break into the West Indies side. He took four wickets in the first innings to help bowl out Pakistan for 159. "I remember the first morning of the Test," Gray said. "I was very nervous knowing that I was about to make my debut with all those legends. Malcolm Marshall was not just a tremendous fast bowler but a friend, since he was always willing to give advice. "My first Test wicket resulted from Qasim Umar being hit on the helmet and the ball deflecting onto the stumps. Overall I wasn't surprised at my performance. I had been visualising playing for West Indies since I was nine years old. Plus, I had played for Surrey in 1985 and had had a fantastic season, so playing for West Indies came as second nature to me." Gray, who dismissed Imran for 61 in the first innings and took six wickets in the match, compares the Pakistan captain to a couple of great West Indian leaders. "It's easy to understand why Pakistan challenged West Indies so often back then. Their cricket mirrors West Indies cricket in so many ways, with the perpetuation of natural talent on both sides, while administratively both nations have struggled historically. The influence Imran had on Pakistan is very similar to what Clive Lloyd and Frank Worrell had for us, and that can't be understated," says Gray. West Indies wicketkeeper Jeff Dujon, who had kept to some of the greatest West Indian quicks, was impressed by Gray's bowling. "He swung the ball with good pace and accuracy, and certainly appeared to have the tools. As time went on, I got the impression that he was what you call a confidence bowler. He went as his confidence went. I think he would have had a better career if he had more self-belief. He certainly had the physical ability." Dujon was dismissed for a pair in Faisalabad. He says Pakistan made up for their lack of extreme pace with good swing and spin bowling. "Pakistan were always a challenge to us. We played each other on mostly flat wickets, and they had good flat-wicket batsmen. 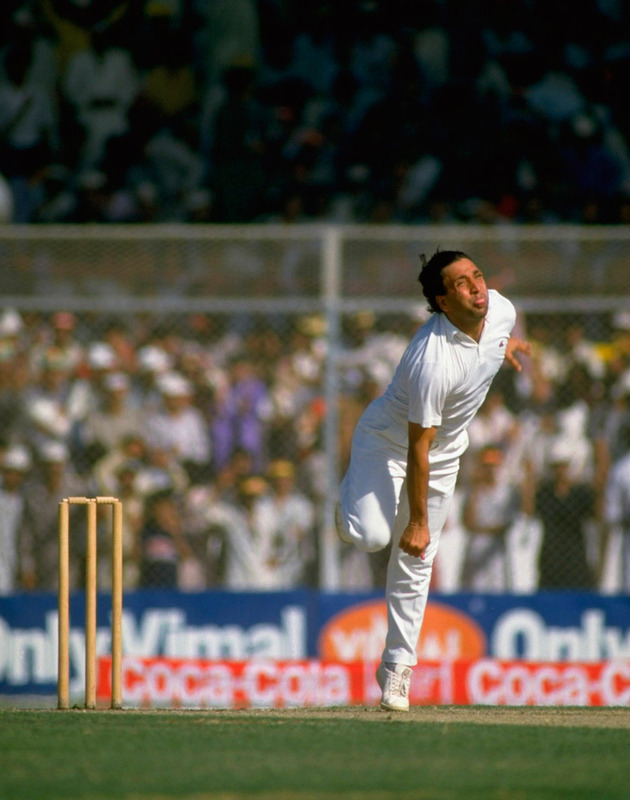 Though they did not have the quantity of pace we had, they had quality swing bowlers and two outstanding spinners." West Indies were not only troubled by Pakistan's spinners but also by a food-poisoning incident that affected their captain, Viv Richards. "A few of us, including manager Jackie Hendricks, went out for Chinese food and the manager told the waiter that we wanted to take some food back for our captain. Well, he got sick and we were fine," remembers offspinner Roger Harper, who faced the first defeat of his Test career in Faisalabad. Twenty-year-old Akram, playing his ninth Test, produced the first significant all-round performance of his career - taking a six-for to keep West Indies' first-innings lead under 100 and then scoring his first Test half-century to help set them a competitive fourth-innings chase. "It was pretty clear to us that Wasim was a player on the rise," says Dujon. "We had seen him before in the ODIs in Australia and knew he was a quality bowler who had all-round ability. He bowled beautifully and kept the pressure on with swing and good pace on a pitch which was quite flat." Rameez recognises Wasim's performance as one that brought him out from under Imran's shadow. "Wasim was instrumental in setting up a win. Here was a star in the making. He played a crucial, gritty knock, also filled, at times, with exciting shots." On the fourth day West Indies were set a target of 240 and they proceeded to collapse in the face of the classic Pakistani bowling duo - reverse swing and legspin; Imran and Qadir. Tauseef, Qadir's spin bowling partner in the match, wasn't even required to bowl in the second innings, such was the legspinner's mastery of the conditions. "The fast bowler-and-legspinner combination is always delightful to watch, and they bowled extremely well," says Tauseef. "Qadir taking wickets in the second innings was mainly because West Indies had always been struggling against legspinners. So it was his day there. It still was really satisfying to see because we were about to win the match and history was about to be made, because we outclassed a world-class team." Rameez took a diving catch at short leg off Qadir to dismiss Richards for a duck - one of four in the innings - and West Indies slipped to 19 for 4 in the chase. "On the previous ball, Viv had planted a vicious flick straight on my shin. I remember diving full length forward to an inside edge to take the catch. Viv was always a huge wicket. "In the last innings they got an unplayable ball in every over from Qadir and in the end were blown away." For West Indies, the defeat was a "never-again" moment. "A loss of such magnitude will naturally leave lasting memories," Dujon says. "Pakistan outplayed us throughout the Test match. They got on top of us early and never allowed us to settle. "When we got rolled for 53 in the second innings, there was a general acceptance that we had not been mentally prepared. We resolved that this would not happen again. "It never did. We ended up squaring the series, one we should have won. Alas, no international panel of umpires in those days."